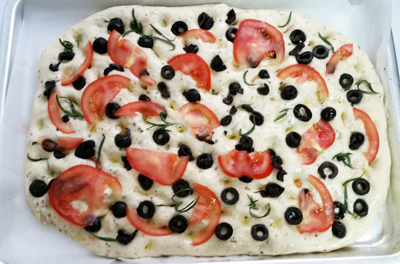 A crunchy golden dimpled crust and a chewy delicious core , topped by any or a combination of rosemary, tomatoes, onions, olives or just the wonderful nutty olive oil with a pinch of salt. 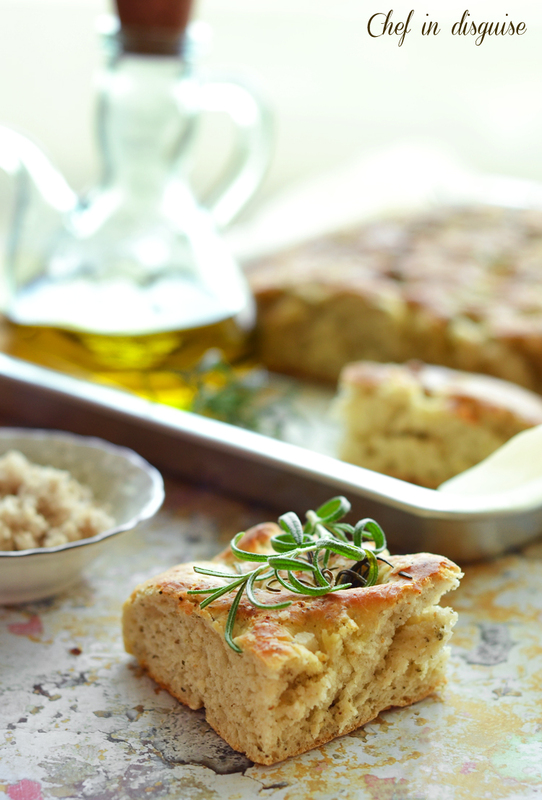 That is Focaccia..a simple savory flat bread that makes a great companion to soups or a wonderful base for a sandwich.. and I have to warn you..it is quite addictive! 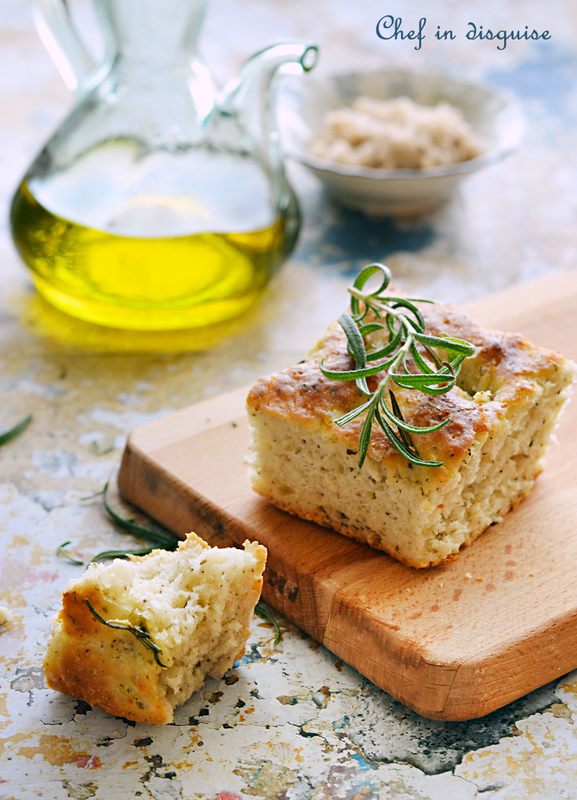 When it comes out of the oven after filling your entire house with the luscious smell of rosemary it will be very hard to stop at just one slice. 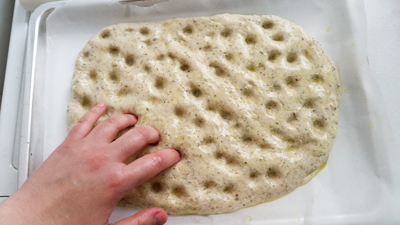 I have tried quite a few recipes for focaccia but honestly untill yesterday none was good enough.. then came all recipes and this recipe with rave reviews. I was planing to make lentil soup for lunch so I thought why not..I made a few alterations based on the reviews, namely proofing the yeast, replacing water with milk ,adding 1 tablespoon of parmesan cheese to the dough and omitting the mozzarella topping. I can tell you this much, the bread vanished off the table so quickly that I hardly managed to save a piece for a sandwich. Even my 22 month old boy loved it! 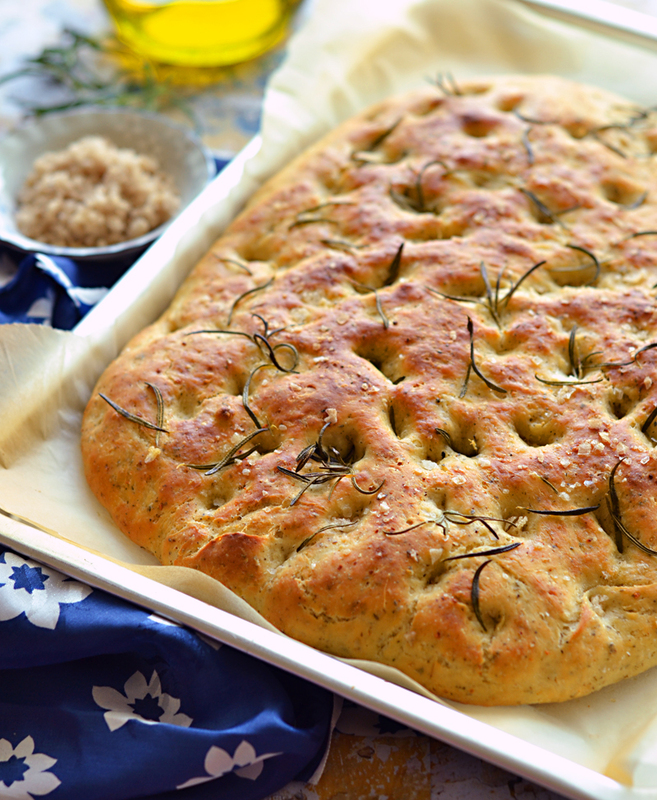 It was everything you want in focaccia and then some more.. If you have never tried focaccia I urge you to do so..you won’t be disappointed. In a large bowl, stir together the flour, salt, , garlic powder, oregano, thyme, basil, 1 tablespoon parmesan cheese and black pepper. Mix in the vegetable oil then add the milk yeast mixture. Stir with a wooden spoon till the dough has pulled together, turn it out onto a lightly floured surface, and knead until smooth and elastic. Center your oven rack, preheat oven to 450 degrees F (230 degrees C). 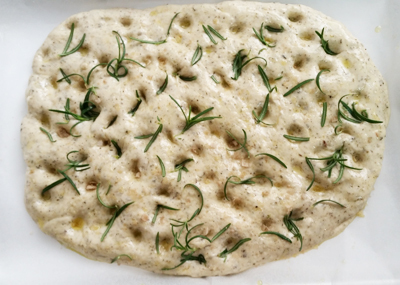 Punch dough down; place on greased baking sheet. Pat into a 1/2 inch thick rectangle or any shape you desire. 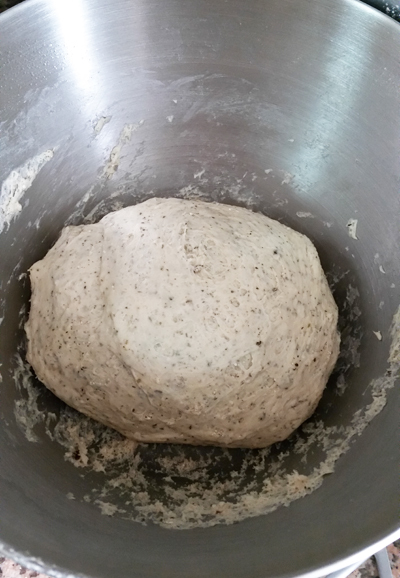 To give the dough the dimples effect, you could use your fingers or the spoon you use to scoop out pasta. Brush top generously with olive oil. Sprinkle with Parmesan cheese, rosemary and salt. Bake in preheated oven for 15 minutes, or untill the sides begin to brown then place under the broiler till the top becomes golden brown. في وعاء كبير اخر،اخلطي الطحين والملح، ومسحوق الثوم، الزعتر، الزعتر، الريحان،و ملعقة طعام جبنة بارميزان والفلفل الأسود. اعجني حتى تصبح العجينه ناعمة ومرنة. ضعي الرف في منتصف الفرن ثم سخني الفرن الى 450 درجة فهرنهايت (230 درجة مئوية). يخبز في فرن محمى لمدة 15 دقيقة، ثم يوضع تحت الشوايه حتى يصبح لونها بنيا ذهبيا من الأعلى. Posted in Appetizer, Back to school, Bread and pastry, Breakfast and tagged baking, chef in disguise, easy bread, focaccia bread, focaccia with rosemary, food photography, olives, postaweek20, recipe, savory bread, step by step, tomatoes, وصفه, خبز الفوكاشيا, طريقه خبز الفوكاشيا بالخطوات المصوره. Bookmark the permalink. I Like this bread, it can be used with every thing. It tured with you very good and yummy. Thanks for the recipe sona,and now i know the answer for my question out there . really it,s very delicious i do it mmmmmm yum yum yummmmy>>>>>>>:)))))))…….. thank u very much….